The Setanta Sports lads give their thoughts ahead of the new season’s kick-off this weekend. The Premier League gets back underway this weekend. Arsenal’s chances are being talked up this year. How do you think they’ll fare? Kenny Cunningham: I don’t buy into [the talk about Petr Cech]. I’ve heard a lot about the difference he’ll make and that he’s possibly worth 10 points to Arsenal. I don’t agree with it. He’s no more than a decent signing. He never recaptured the level he had prior to the head injury he suffered, and I don’t think he’s as good an athlete as he was in his prime, in terms of reaction levels. He’s a good signing, his experience will help, but I don’t think he’s worth an extra 10 points and I don’t think he’s the difference between them winning and losing the Championship. They could push Chelsea, but will they win it? I don’t think keeper was a priority. They could do with a top-class forward and a centre-half. Koscielny I’m a big fan of, but I think Mertesacker has his limitations and can be exposed badly. Arsenal encourage their full-backs high up the pitch, which leaves their centre-backs exposed. Chelsea, maybe to a smaller extent, have the same weaknesses. Terry and Cahill have a lack of pace, but Mourinho’s clever enough not to expose them. He utilises their strengths, whereas Wenger doesn’t [with his centre-backs]. I think there’s still a fragility there. They could go close, but that would be because of a lack of quality in the Chelsea and City teams. So they’ll be short if they don’t make any other acquisitions. Matt Holland: Last time Arsenal signed a goalkeeper over 30, it was Jens Lehmann and then they won the league. Man United did something similar with Van der Saar. Does it answer all their problems? Probably not. There are still question marks over whether they have that consistent level of fight. But Cech makes a big difference. He’s better than what they’ve had in recent seasons and he gets them closer to winning the title. What about Man City? How big a difference can Raheem Sterling make? Was he worth the money? John Hartson: He’s 21. He’s English. If he has a couple of good seasons and lights up the Premier League, you could sell him for £100million. Who’d have Gareth Bale would move for £100milion? Who’d have thought Liverpool would pay £32million for Christian Benteke when Aston Villa were turning down £15million bids a few months ago? That’s where we are unfortunately — it’s obscene amounts of money. That’s the market, whether he’s worth it I don’t know. It’s a good signing. Him leaving Liverpool was a little messy. Do you blame the agent? Him? Liverpool? I don’t know. That left a bit of a stain on it, for me. He’d have wanted to have left on better terms. But he’s gone to a club he thinks will challenge for honours more than Liverpool will. He obviously felt he did the right thing. Was it an easy decision to leave [as he said]? I can’t really speak for him. But I don’t think Liverpool wanted to lose him. But at £50million, they’ve come out of the deal looking fairly good. Does money matter for Sterling? I don’t think it should be for a player his age, because he’s going to earn millions. I went from £150 a week at Luton to £4,000 a week at Arsenal. But there were players there on £10-15,000. Ian Wright, Tony Adams, these type of players. I always felt the best players should earn the best money. But now, you’ve got bang average players earning phenomenal money. You’ve even got kids now, who’ve never made a first-team appearance, driving into training in their Bentleys. They’re sitting around the youth team earning massive amounts and whether that’s good for football, I don’t know. Good luck to the players. As a footballer, you have to take advantage of it. And what about Liverpool and their new-look squad? Matt Holland: It’ll be interesting to see how they react without Steven Gerrard. It was different for them last season. It was difficult for Rodgers to replace those goals [that Suarez provided], but he’s tried to do that with Danny Ings and Benteke. I think Benteke’s a fantastic signing. If you look at his goals-per-game record, it shows he’s more than capable of scoring 20-plus for Liverpool. James Milner, likewise, brings a bit of experience into the group. But he’s under pressure to deliver. The pressure will start to build on Brendan Rodgers if he doesn’t get the results by around October. Last season, they only won one of the first seven or eight games and all of a sudden, they were miles behind. So it’s quite key to get off to a good start. The pressure will be there, especially after they spent so much money and haven’t won anything, although they came close [the season before last]. I think Danny Ings could be a good signing. I’m a fan of his. I know Charlie Austin is more experienced and scored more goals, but I think Ings’ movement is probably better. There’s a lot to work with with Danny Ings. There was a lot more pressure on Sterling last season, and he was actually asked to play in a different position than he was used to. They played him in a centre forward role, which isn’t his best position. [Roberto] Firmino’s come in as well, so Rodgers will feel he has more goals in the team this year. Will it be a failure if they miss out on the top four? Matt Holland: I don’t think it will be a failure for Liverpool not to get in the top four. Particularly on the back of what others have spent. But they’ll have to produce a better challenge than last year. It will be crucial to do well in the cup competitions. Some silverware will help, as it did for Alex Ferguson [when he first came to United and subsequently won the FA Cup). But personally, I fancy them to fall just short of the top four. And what of the recent Mourinho-Wenger handshake shenanigans? Kenny Cunningham: Players are amused by it. It’s laughable inside the dressing room. But it doesn’t affect the players. I find the whole Mourinho and Wenger thing quite boring. I don’t subscribe to the theory that they should just shake hands. It’s false if you don’t have any respect for the other person. I think [shaking hands] is the wrong thing to do actually in those cases. So who will make up the top four ultimately? John Hartson: I think Chelsea are the team to beat again. They’re very solid at the back. The back four very seldom changes. And then they have the likes of Matic, Hazard, top top players. The only doubt is whether they can keep Costa fit. He’s got everything — aggression, he closes people down, he likes to rough up the centre backs and he gets goals. But whether they can play him for 35-40 games, I don’t know. Arsenal have only brought in Cech. They’ve got a great midfield. Will he play Walcott down the middle a lot more rather than Giroud? They’re totally different players, Walcott looks to go in behind, Giroud faces up to everything. United have bought well. I think they’ll add again, whether it’s Kane or another centre-forward, there’s still a bit of work to do. Defensively, playing Blind at centre-back, I wouldn’t have minded playing against him every week. I think they’ll get into the top four. My top four would be Chelsea, followed by City, then Arsenal — goalkeeper is a massive position, especially with someone as good as Cech — so they’ll be be stronger, and then United fourth. The likes of Liverpool, Tottenham, Swansea, Southampton will all be around the places below again. Matt Holland: I don’t think a team like Chelsea will run away with it as they did last season. The pressure has to be on Louis van Gaal and Man United to at least challenge for the title. We’re still questioning whether they’ve got the right players in and the right players covered. David de Gea’s future is up in the air, people say he needs an experienced centre-back. They have Daley Blind, but he’s not the biggest or the quickest. People talk about Costa at Chelsea, if Rooney’s out, are Hernandez and Wilson going to be able to step up? You could also play Depay there. But there are still question marks over whether United have the players to mount a title challenge. Presenter Connor Morris and pundits Kenny Cunningham, John Hartson and Matt Holland were at the Setanta Sports studios in Dublin yesterday to mark the return of Premier League Central for the 2015/2016 Premier League season. Premier League Central, the first place to see Premier League highlights, is back on the air this Saturday, August 8th at 8.30pm. Email “Who will prevail in this year's Premier League? Here's what the experts think”. 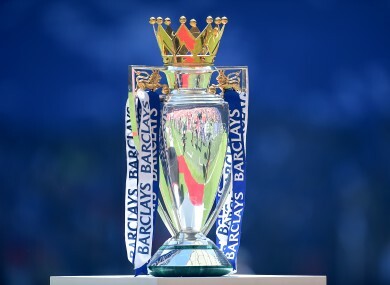 Feedback on “Who will prevail in this year's Premier League? Here's what the experts think”.